Introduction: Pontiac saved the best for last with its Fourth Generation Firebird. Although these Firebirds would be the fastest and most powerful Firebirds since the glory days of old, the overall decline in the sport coupe market and the changing taste of young performance buyers to newer, more refined imports, sealed the fate of the Firebird. At least it went out on top. Comments: The Firebird was substantially revised for 1993, the beginning of its fourth generation. The exterior styling was dramatically aerodynamic, and incorporated plastic front fenders, although much of the floorplan and rear suspension was carried over from the third generation. The front suspension was new, and incorporated a new short/long-arm design and incorporated rack-and-pinion steering for the first time. The Firebird lineup was reduced to three models, Base, Formula, and Trans Am, the convertible was eliminated and engine choices were now just two. The base engine was a new 3.4 liter V6, based on the previous 3.1, rated at a decent 160 bhp. But the big news was the new LT1 version of the classic 5.7 liter small-block V8 rated at a stout 275 bhp. Furthermore, the LT1 could be ordered with a six-speed manual transmission and was standard in both the Formula and Trans Am models. 3.4 liter V6 160 bhp. LT1 5.7 V8 275 bhp. Performance: 5.7/275: 0-60 in 5.6 seconds, 1/4 mile in 14.1 sec. @ 98.45 mph. Comments: 1994 saw the reintroduction of the convertible and a special blue and white 25th Anniversary Trans Am. Also new was a GT version of the Trans Am which added additional luxury features such as leather seats. Perhaps most annoying was a new "Skip Shift" feature on the six-speed manual which, depending on throttle position, would force an upshift from first to fourth gear for better fuel economy. This lead to an explosion in aftermarket skip shift eliminator kits. Comments: 1995 saw minimal changes to the Firebird. Traction control was added, the Trans Am GT trim was dropped, and at mid year, GM's familiar 3.8 liter V6 was offered as an alternative to the 3.4 V6. Comments: With the new 3.8 V6, there was no need for the 3.4 liter engine, so it was dropped for 1996. Pontiac offered an optional 3800 Performance Package for the Base Firebird which added four-wheel disc brakes, dual exhaust, 3.42 axle ratio, limited slip differential, and alloy wheels. Formula and Trans Am models saw the 5.7 liter V8 gain 10 bhp from the use of dual catalytic converters for a total of 285 bhp. But now there was a new top engine choice. Pontiac reintroduced their "Ram Air" cold air induction system for the 5.7 V8 as option WS6 available on Formula and Trans Am coupes (not convertibles), built by SLP under contract to GM. Ordering the WS6 package added twin nostrils (air intakes) on the hood which boosted the engine rating to 305 bhp. All came with 17" wheels and 275/40-17 tires, plus the 1LE suspension, except with DeCarbon shocks using different valving from the stock shocks. A total of 2,575 WS6 cars were made in 1996, out of a total of 30,937 Firebirds. Air Conditioning made standard on all V8 cars. Factory chromed wheels now available. Exterior Colors: Medium Patriot Red dropped; Cayenne Red Metallic, Bright Green Metallic added. Red leather interior now available. Special Options: AR9 = Leather / 1LE = Perf. Suspension / GU5 = Auto Perf. Axle / L36 = V6 Perf. Pkg. / PO5 = Chrome Wheels / R6V = Firehawk / UP3 = Compact Disc / WS6 = Ram Air Pkg. Comments: The WS6 was now available on Formula and Trans Am convertibles. Also new was the option of a 500-watt Monsoon audio system. 30,756 Firebirds were built in 1997, and of those, 3,847 were WS6 cars (2,827 Trans Ams, 473 Formulas, and 41 Formula convertibles). Daytime Running Lamps (DRL) introduced on all f-bodies. Exterior Colors: Polo Green and Dark Purple Metallic dropped. Medium Quasar Blue dropped at midyear. Bright Purple Metallic introduced. Comments: Pontiac replaced the LT-1 with the LS-1 V8 engine, which had first appeared in the 1997 Chevrolet Corvette. The all-aluminum LS-1 was rated at 305 bhp in base trim and 320 bhp in WS6 "Ram Air" mode. Firebirds also received new front end styling, and Base Firebirds could be ordered with a Sport Appearance Package which gave them some of the more aggressive look of their bigger brothers. The Firebird coupe and Formula received a new nose with pop-up quad headlights and fog lights. Trans Am received same headlights, with different nose and fog lights. Taillights received honeycomb pattern. Slightly different wheels introduced on Formula and Trans Am initially, but disappeared later, replaced by the original 5-spoke wheel. 1LE performance suspension package now available on Formula, but requires WS6 package. Firehawk cancelled for 1998 due to safety certification problems (will return for 1999). New interior cloth on Camaros: Dark Gray, Neutral and Red Accent. Leather interior available in Dark Gray, Neutral and White. Exterior colors: Navy Blue Metallic and Sport Gold Metallic added. No official Firehawk (WU6) production. Comments: The 1999 Firebird got only minor changes, including a Torsen limited-slip differential for V8 models (and V6s with the Performance Package). A few new options were available, including a Hurst shifter for the six-speed manual transmission and a power steering cooler on V8 models. Pontiac celebrated the Trans Am's 30th Anniversary with a special White with Blue trim color scheme along with blue-tinted alloy wheels and a white leather interior. Comments: The 2000 model was a complete carryover from 1999. Comments: 2001 saw a small increase in engine ratings, with the LS-1 increasing to 310 bhp and 325 with the WS6 option. WS6 package included new 17x9 wheels. 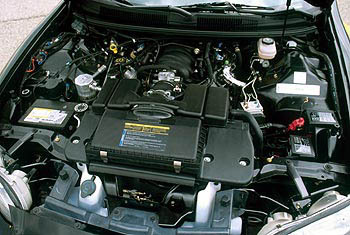 The Ram Air engine was now no longer available on the Formula trim. In 2001 SLP introduced their Firebird GT as a factory available option package. Comments: 2002 would prove to be the last year for the Firebird, and Pontiac decided to issue a special 35th anniversary Firebird (as opposed to Anniversary of the Trans Am). This special model was a Trans Am which featured yellow paint, black wheels, and special graphics. Not really much of a send off for one of only two vehicles that survived from the muscle car days to the modern era without interruption.